Aaron Cunningham is settling in well at Blyth Spartans and believes they deserved their point against Darlington based on how hard they worked. Cunningham, on loan from Hartlepool United until January, played his second consecutive 90 minutes in which the Quakers had two goals disallowed, hit the woodwork twice and directed a few chances inches past the post. “I thought we deserved a point given how hard we worked,” the 20-year-old said. “All the lads worked their socks off. We always knew coming here it was going to be a hard game. “Darlington were direct – we knew they were going to be. It was hard for us because we like to get the ball down and play but when they boxed us in, all we could do was go wide because they had big men all over the pitch. It was a pretty even first-half but if they were to be a winner in the second 45 minutes, it looked to be Darlington, yet Blyth managed to carve out final golden opportunity in the dying stages. Adam Wrightson, on as a half-time substitute for Jarrett Rivers, cut in from the right wing but could only pull his shot wide of the bottom right corner. Cunningham said: “We had a great chance at the end there to slot it home but unfortunately it didn’t happen in the end. 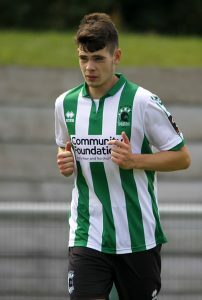 Having made just one professional appearance prior to joining Spartans, Cunningham’s presence in the back line has inspired Blyth to a remarkable 8-1 win over Chester and a 1-1 draw at a potential playoff contender. Cunningham showed he was not one to shy away from a physical battle – holding his own against the height, strength and power of Reece Styche and Simon Ainge. “Since training with the first team at Hartlepool and Blyth, I am used to coming up against lads like that a bit. Especially for me, I’m not the biggest lad! I’m tall but I’m like a rake – I don’t have much on me!” he laughed. “It’s a learning curve for me – coming on loan here and coming up against lads like that, I need to learn from it and hopefully it can continue so we can grind out more results this season. “We always knew it was going to be difficult. On Saturday, a game like that, it’s never going to come around in the next however many years, we know that. “But again, it’s just how hard the lads worked, we held out for a 1-1. They must have had so many chances but the lads put their bodies on the line. That’s all you can ask from them really – especially as a defender as well. Cunningham missed the opening two league defeats to Hereford and Bradford (Park Avenue) after serving out the remainder of his three-match ban following his dismissal against Torquay United in the National League. He labelled the Blyth players “top, top lads” and is certain that is now starting to show on the pitch. “The lads are unbelievable,” he confessed. “As soon as I walked in the dressing room they’ve been top, top lads. “It’s been unbelievable. It’s just nice to be a part of it. It shows on the pitch. No one is moaning at each other, no one is shouting at each other when it’s going bad.